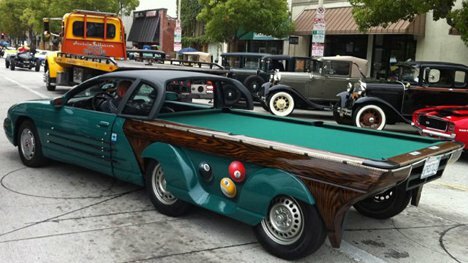 Pool sharking just got a little easier with this impressive lovechild of a Chevy Monte Carlo and a regulation pool table. The amazing mashup is the work of Vini Bergeman of Discovery TV’s Kustomizer series. As if the fact that its back end is a pool table wasn’t cool enough, it also features a TV, refrigerator and removable roof – and it can still go 100 MPH. Hopefully you remember to put the balls and sticks away first, though. Oh, and did we mention that the pool table detaches from the rest of the truck? You just pull over and pop the table off of its mounts on the cab. The automatic leveling system ensures you’re playing on a fair table (and makes the whole thing seem way more high-tech). Then after you’ve beat the yokels out of all of their cash, you hook it back up and hit the road again, leaving legions of stunned onlookers in your wake. The pool table car is available for rent in the Orange County area if you’re interested in giving it a try. See more in Art Vehicles or under Transportation. January, 2012.